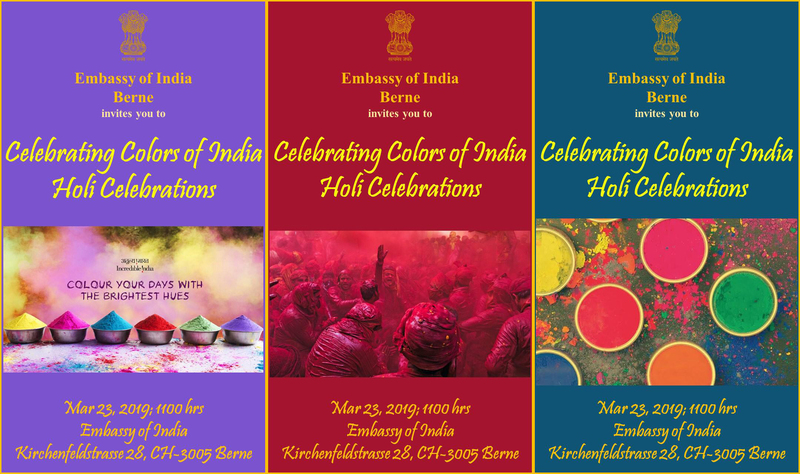 You are cordially invited to CELEBRATING COLORS OF INDIA: HOLI CELEBRATIONS on March 23, 2019 at 1100 hrs at Embassy of India, Kirchenfeldstrasse 28, 3005 Berne. Kindly confirm your participation by sending e-mail to info.berne@mea.gov.in. We are really pleased to be able to invite you to Rabindra Jayanti abong Sangeet Sandhya on 19th May. Our Rabindra Jayanti celebrations begin with Prabhat Pheri on the banks of Lake Zurich from 8 am onwards, on May 19th. Please join us at Mythenquai 21, 8002 Zurich (Mythenquai carpark) in singing Rabindrasangeet on the banks of the lake. Please sign up here for Prabhat Pheri. Later on in the afternoon, let us all meet at Wettingen for an evening of cultural celebration with local artists who will perform in Bengali. (Sign up for this is now closed as it was on a First Come First Served basis). This will be followed by a very talented singer, Aritra Dasgupta, especially invited from Kolkata to entertain Swisspuja members. We are sure many of you are familiar with this rising star from Bengal, who wowed us on the Sa Re Ga Ma Pa shows. For those who haven't heard him yet, here is a little introduction to his songs. The entry tickets for this evening’s entertainment (local artistes and Aritra Dasgupta) is a nominal CHF 12. There will be two food counters inside the hall from where one can buy snacks and/or vegetarian or non-vegetarian dinner. Address : Evang.-ref.Kirchgemeinde Etzelstrasse 22 5430 Wettingen. Parking available in church grounds. To ensure that you have a place for this high demand programme, we request you to kindly sign up and pre-pay the entry fee, for the total number of attendees from your family. Sign up to attend ‘Sangeet Sandhya, 2019’. Swisspuja wants to celebrate it's sweet 16th year with a difference - how about an overnight picnic, with family, at a place where we can unwind with a view of the mountains and a drink by one's side? Interested? We understand that some of our members would just be able to stay for the day and we will have a price option for them too. But do watch this teaser, specially made for you, our Swisspuja member! Price details and sign up forms to follow soon. Watch this space. We will also send out a follow up email.